Sindh Public Service Commission (SPSC) Sindh. DOMICILE: Mirpurkhas Division (Tharparkar. Umer Kot, Mirpur Khas District). Priority will be assigned to candidates of Tharparkar District. The applications of candidates of other Districts will not be entertained. 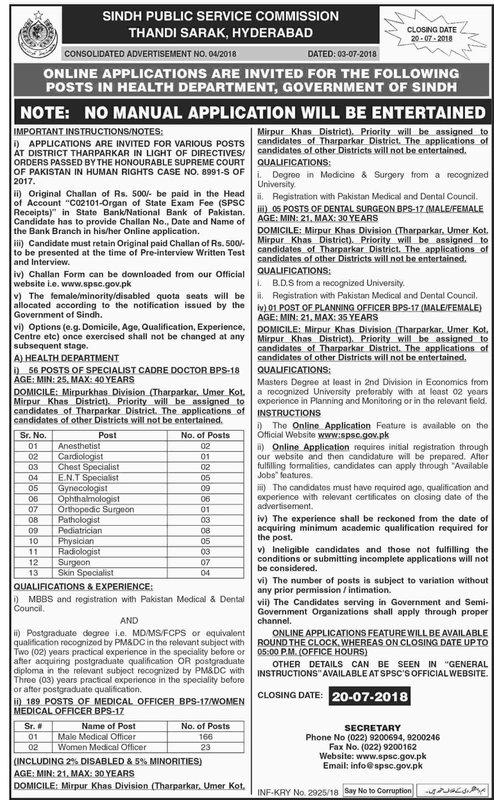 i) MBBS and registration with Pakistan Medical & Dental Council. ii) Postgraduate degree in ie. MD/MS/FCPS or equivalent qualification recognized by PM&DC in the relevant subject with Two (02) years practical experience in the speciality before or after acquiring postgraduate qualification OR postgraduate diploma in the relevant subject recognized by PM&DC with Three (03) years practical experience in the speciality before or after postgraduate qualification. Mirpur Khas District). Priority will be assigned to candidates of Tharparkar District. The applications of candidates of other Districts will not be entertained. i. Degree in Medicine & Surgery from a recognized University. DOMICILE: Mirpur Khas Division (Tharparkar, Umer Kot. Mirpur Khas District). Priority will be assigned to candidates of Tharparkar District. The applications of candidates of other Districts will not be entertained. i. B.D.S from a recognized University. DOMICILE: Mirpur Khas Division (Tharparkar, Umer Kot, Mirpur Khas District). Priority will be assigned to candidates of Tharparkar District. The applications of candidates of other Districts will not be entertained. QUALIFICATIONS: Masters Degree at least in 2nd Division in Economics from a recognized University preferably with at least 02 years experience in Planning and Monitoring or in the relevant field. ii) Online Application requires initial registration through our website and then candidature will be prepared. After fulfilling formalities, candidates can apply through "Available Jobs" features. iii) The candidates must have the required age, qualification and experience with relevant certificates on the closing date of the advertisement. iv) The experience shall be reckoned from the date of acquiring minimum academic qualification required for the post. v) Ineligible candidates and those not fulfilling the conditions or submitting incomplete applications will not be considered. vi) The number of posts is subject to variation without any prior permission/intimation. vii) The Candidates serving in Government and Semi-Government Organizations shall apply through proper channel. OTHER DETAILS CAN BE SEEN IN -GENERAL INSTRUCTIONS" AVAILABLE AT SPSC'S OFFICIAL WEBSITE.